The GLEWS+ Management Committee (GMC) is composed of the Director-General or an Assistant Director-General from each organization, or their nominees, and is responsible for providing strategic direction and oversight of GLEWS+ implementation. The GLEWS+ Task Force (GTF) is comprised of designated GLEWS+ focal points from each of the three organizations and their regional entities. These focal points provide the link to the respective early warning and response systems of the organizations. The GTF is responsible for implementing GLEWS+ and workplans after approval by the GMC. 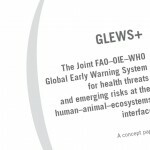 A GLEWS+ guidance working group comprised of key international stakeholders would provide suggestions and guidance to GLEWS+ activities.